If you’ve been reading my newsletters for the past few months, you know that I am passionate about using beautiful things in everyday life and believe that it makes a difference. This month I want to share one of the first times I made a significant decision to invest in beauty. As a graduate student in my early twenties, I rented a studio apartment and acquired some basic furniture — a round kitchen table, a desk and swivel chair, a twin bed. My dresser was a non-descript four-drawer cardboard contraption that I kept in the closet. Sometimes I struggled a bit to open the drawers, but overall it fulfilled its function just fine. Besides I was more concerned about teaching, keeping up with my classes, and getting some sleep. A few years later, now in a larger apartment, I decided that it would be nice to have a real dresser, a wooden dresser. Off I went to a few furniture stores. The dressers were nice — the drawers functioned so wonderfully smoothly — but I was unsettled about the expensive purchase. I thought of all sorts of reasons why I didn’t really need a dresser. I even discussed my struggle with a therapist. And then one day, at the back of a furniture store, I came across an exhibit of Shaker-inspired furniture made by a local woodworker. He didn’t have any dressers on display, but there was a corner cupboard with drawers. After much deliberation and a few trips back to the store, I called the woodworker. I drove out to his house and discussed the possibility of him building me a dresser. Before leaving, I put down a deposit. A few months later, the woodworker called. The dresser exceeded my hopes — the beautiful wood, the attention to details. I drove home very carefully and made several trips up and down the stairs carrying two drawers at a time and getting help with the body of the dresser. Once it was assembled in my bedroom, I just sat and admired it, hardly believing it was mine. This dresser has made four moves with me and the cherry wood has darkened over time. I still admire the craftsmanship and how easily I can open and close the drawers. And every day, whether I think about it consciously or not, this dresser is a reminder of a pivotal decision to bring beauty, and not just function, into my life. I am glad that I took my time and didn’t talk myself into buying one of those other dressers. As I look back on this significant purchase, I understand that the beauty of the local woodworker’s furniture spoke to me and enabled me to make this investment. That beauty has brought me joy and enhanced my life for the last twenty years. I have never regretted my investment; I am profoundly grateful that I recognized the value of having not just any dresser, but a beautiful dresser that I love. What’s the first time you chose to invest in beauty? I’d love to hear. 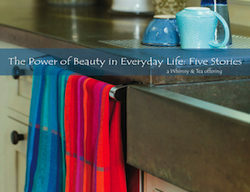 Does everyday beauty make a difference?